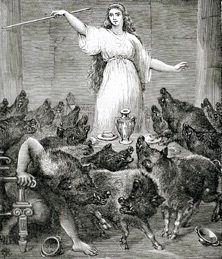 Circe transforming Odysseus’s men into pigs. Gustave Doré (?) Mid-19th Cent. Engraving. the spirits of the dead in the realm beneath the earth. This is the place, also, for the initiate who dwells in darkness, or sleeps for a while in the underworld realm, until the goddess or god has shown him the light or set him on the right path. There is, then, a natural equation in the very ancient association of the initiate and the pig, even to the extent that the two are sometimes indistinguishable. Such was the case with the Celts, whose “bardic initiates were frequently addressed or known as ‘pigs’.” (3) As we shall see, this title is not unique to the Celts. This journey to the limits of the earth, “the perimeter of the chthonic,” (7) is a tale of initiation that describes numerous crossings of sacred thresholds along the path. There is concealed within the telling of this sacred epic an underlying story of navigational chartings, the surveying of vast geographical boundaries, and the obtaining of other measurements pertaining to the location of bearing points. It is a virtual Survey of Boundaries, a compendium of border crossings in which every thread in the complex weaving of pathway, and enclosure, and the setting of limitations and boundaries between worlds, is here measured and explored. Even Hermes, the god of boundaries, makes a brief appearance. The adventure is a veritable textbook for those seeking initiation. any course left open to us. But I think there is none. smoke rising in the middle through the undergrowth and the forest. His speech becomes intelligible only if we look to the underlying concept of ‘orientation’ in its most sacred sense. This is the precise context in which Homer operates, intending to convey the humorous situation of being so disoriented that, even knowing that one has arrived at the easternmost limits of the world, one cannot find the rising sun. Such “geo-graphical disorientation” (18) has dire consequences for Homeric man for whom there are only two “expressions of direction, [which] influence every aspect, every gesture, . . . of human life . . . [and which define absolutely] man’s relationship to his universe.” (19) These are the points of the rising and setting sun: Eos, that place of beginnings, of life, from which emerges the personified light of ‘rosy-fingered Dawn’; and Zophos, an amorphous region of darkness and doom, endings and death. Without the sun as “his most definitive guide . . . his great measuring rod whose course measures time and divides space,” (20) Odysseus and his crew are truly nowhere. The richly-layered nuances of sacred language conceal within the name of Eurylochos, both a description of the place where they have landed, and a prophetic announcement of what is to befall the group that he leads “through undergrowth and forest” (24) to the center. The foremost interpreter of bardic language, Robert Graves, suggests that his name means “extensive ambush.” (25) This is but a clue. The word lochos describes ‘a place for lying in wait, ambush, ambuscade’, as for example, ‘the lair of wild beasts’. In all languages in which forms of the word for ambush are found, it quite literally means, ‘contained or enclosed by a wood, or woodland’, which in its passive sense, suggests ‘to be caught in an ambush: to be ensnared’. Mention must also be made of a secondary meaning, which in this other sense is a term used only in reference to awaiting the birth of a child: ‘a lying in’; lochos being related to locheia, the word for childbirth, which in its form as Lochia, is an epithet of the woodland goddess Artemis, or Diana, in her aspect as goddess of childbirth. Through a confluence of interwoven words, we are able to perceive that which is hidden in plain sight: that Diana, Goddess of the Woodlands, Queen of the Oak, Mistress of Wild Things, is the goddess whom they seek. She is here disguised as Circe: a weaver of spells, the enchantress who sits enthroned at her loom at the absolute center of a magical circle surrounded by forests of oak and bounded on its circumference by the sea. It is she who lies in wait for Eurylochos and his initiates, ready to ensnare them in her tangled skeins. When they come upon the lair of the Dianic sorceress in a round clearing in the wood, her tamed beasts await them at the gates. The wild and primitive otherworldliness is palpable. It has the ring of a near-death experience. As they stood in the forecourt of the palace, they heard within the walls a “woman or goddess” (27) “singing in a sweet voice as she went up and down a great design on a loom.” (28) The unearthly voice wafted through the air, weaving in and out between the pounding rhythm of the loom, reverberating back and forth, back and forth, like waves against the walls of polished stone, until “the whole place mur-mur[ed] to the echo of it.” (29) The sailors, entranced by the eerie mantra, could not resist the lure of this “goddess with the glorious hair.” (30) With one voice, together they called to her. Eurylochos waited outside, for he suspected treachery. malignant drugs, to make them forgetful of their own country. And in such a place of liminality, (39) that threshold territory of neither here nor there, we should be surprised not to find Hermes Propylaios, or Hermes ‘Before the Gate’, for this is exactly his domain. Homer does not disappoint. Odysseus tells us that as he was nearing “the great house of Circe, skilled in medicines,” (40) to rescue his men from their state of suspension, there, as he “came up to the house, Hermes, of the golden staff, met me on my way.” (41) Their place of meeting is an amorphous border-crossing that wavers between life and death. Hermes is the guardian of this “middle realm between being and non-being . . .
he stands on ground that is no ground, and there he creates the way . . . out of a trackless world – unrestricted, flowing, ghostlike – . . . .” (42) This god of boundaries knows no bounds, for he is the aggelos, the ‘angel’, or messenger of the gods, who moves freely between the upper and lower worlds. Calling him by name, Hermes ridicules Odysseus for being “ignorant of the land-lay,” (43) a subject about which this deity knows much, and gently chastises him for thinking that he could survive “the malevolent guiles of Circe” (44) without the aid of an equally cunning sorcerer, such as himself. sometimes curled as the snake is curled round the staff of Aesculapius. and she will be afraid, and invite you to go to bed with her. so she will not make you weak and unmanned, once you are naked. So Odysseus, with the aid of the boundary-marking god, has staked the goddess-queen of the island of the Earth and simultaneously pierced the veil of her mys-teries by the insertion of his sword into the magic circle of her world. This is an act that only a magician could perform. Of this act, Karl Kerenyi has observed, “the circles of her magical power have been broken through and she has only herself left.” (75) It would be more accurate to say that, like her wild animals who fawn before her gates, she has been tamed, or neutralized, but she is not herself as we know her. And we may never know her, because, like the sun, her circle is endlessly moving and therefore cannot be pinned down. Although Circe’s magical palace lies at the very heart of her woodland island in the sea, the island itself lies at the outer limits of the world. “The dread goddess who talks with mortals,” (76) as Homer calls her before the intrusion, lives “on the periphery of the real.” (77) She is everywhere and nowhere. She is “not of this world,” (78) but dwells within circles, within circles, within circles, which she herself conjures and creates, weaving the world at the absolute center of the innermost circle, “at a point of beginning.” (79) Odysseus’s companions, outsiders whose only place is at the fringes of the circle’s edge, have dared to enter this magical circle, a dangerous sacred landscape, a sanctuary veiled in mystery. Theirs is a serious transgression. And so, with the stroke of her wand, the “primal sorceress” (80) puts them in their proper place at the edge of her circle where, as outsiders, they belong. Circe owns that circle and is that circle. Her identity is so bound up with it that she is actually named for it. The Greek word Kirke literally means ‘circle’. Words from this same root encompass only things of a circular nature, as for example, the kirkos, a falcon hawk identified with Circe. Even in bird form, she maintains her unbounded circularity, flying, as falcons do, in a circle, “turning and turning in the widening gyre,” as the poet Yeats has described. (81) Another word inspired from its originally circular form, but which is thought to be of entirely separate origin, is that derived from the Middle English kirke and the Anglo Saxon circe, which are the base forms for the Scottish word kirk, meaning ‘church’. These base forms, in turn, are believed to have derived from the Greek word for ‘the Lord’s house’, kyriakon. This, from kyrios, ‘master’, ‘lord’; kyria being ‘mistress’, ‘lady’, in its feminine form; and from Kyriaki, the Greek word for ‘Sunday’. All are formed from kyros, meaning ‘power’ and ‘might’. One has to listen very carefully to decipher the most imperceptibly minute, closely-woven subtleties of differentiation and intent. Such are the “coincidences” of the sacred. With this definition in mind, the true esoteric purpose of Odysseus’s visit is revealed. As with all things of a magical nature, there is more here than meets the eye. One of the not so secret, but difficult to detect, missions in the story of Circe is to obtain the circumference (the outside edge, or perimeter) of the circular island of the goddess of the Sun. But it is she, herself, who is the object of measurement. Odysseus uses pi to find God. Once he has determined that the center is not everywhere, that it can be pinned down to a specific location, and that the circumference is not nowhere, that it can be measured from this central point of reference, the power of Kirke has been parsed, and definitions of God fail. And, after gathering the remaining twenty-two other companions, who have been hiding out with the terrified Eurylochos at the farthest boundaries of Aiaia’s shores, the surveying is completed. Thus has Odysseus come full circle on the island of the oaks at the place of the rising sun. He has found his bearings and stands on sacred ground of his own making, on “space which is oriented and subdivided according to a celestial model.” (96) From this circumscribed vantage point, he can now accurately observe the path of the sun, the changing of the seasons, and all the movements of the heavens. Here he remains in the embrace of the radiant Circe for the space of a year. (97) He is, at least for one moment in magical time, at one with the universe.